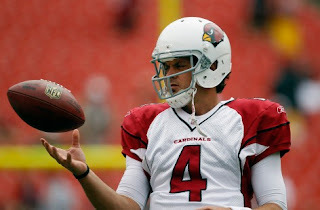 We’ve known for quite a while now that Kevin Kolb is headed to Buffalo, but the Bills only made it official on Monday. The team issued a release announcing that they’ve signed the former Eagle and Cardinal to a two-year deal. They also released some quotes from General Manager Buddy Nix about the decision to sign Kolb, which many have seen as a move to give themselves a temporary starter while they look for a long-term answer via the draft. Nix wasn’t willing to go that far. Kolb’s main competition for the job at present is Tarvaris Jackson, who said he re-signed with the Bills because Nix convinced him that there would be a real competition for the job this offseason. If the Bills do find someone they like in the draft, it will likely mean that only one of the two veterans winds up making the team. Nix probably said less about that aspect of the competition, but it’s now officially underway all the same.